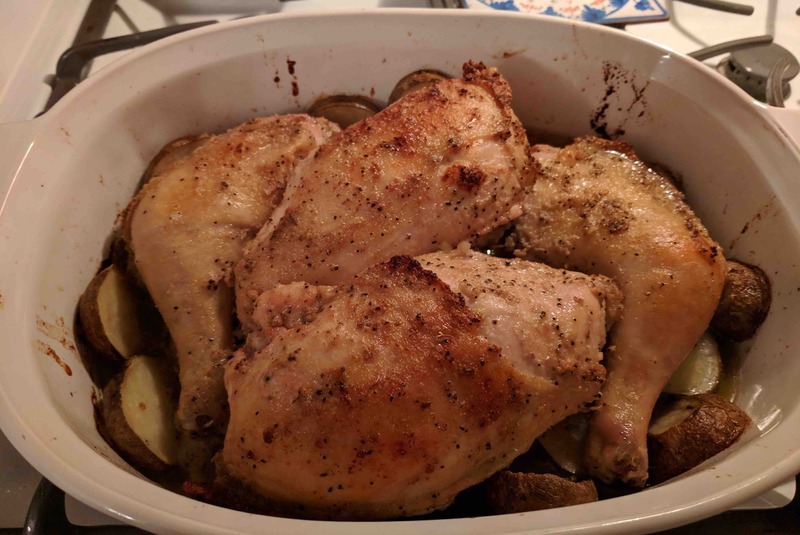 I really like the combination of chicken and potatoes and this recipe adds in enough butter and garlic to make a gal swoon. For an additional flavor, I used some of the Penzey’s Florida Pepper that I received free in my last order. It is pepper with citrus notes of lemon and orange. Of course, you can use lemon pepper or plain black pepper in its place. The potatoes come out nice and creamy. Any leftovers potatoes go terrific in a frittata, too! Cut off the wings, backbone and rib meat and store for later use in stock. Cut off off the thighs and divide the breast in half to have 4 large pieces of chicken. Make the marinade by stirring all the ingredients together. It will form a loose paste. Rub it all over the chicken and then place the chicken in a zip top bag with any remaining marinade. Place in the refrigerator for at least an hour and as long as 8 hours. Place the rounds of potato along the bottom and sides of a casserole dish. Place the chicken with its marinade into the dish, skin side up, and pour the melted butter over everything. Bake for 1 hour, basting occasionally. Check the internal temperature and continue to cook until the thighs reach 165 degrees F, about 15 to 30 minutes more.